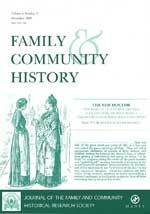 Family & Community History is now included in SCOPUS - Comments from the evaluation team include: "This is the kind of journal that ought to be in SCOPUS and it impresses in terms of its editorial policy and homepage". 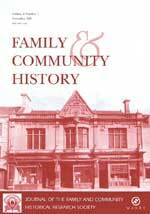 Family & Community History brings together historical and geographical approaches to communities and families in the past, setting them in an awareness of the importance of place. Places provide the raw material for testing wider generalizations about the past and the Journal explores the ways in which studies of local places can extend academic and theoretical contexts. In pursuit of this aim we believe a range of methodological approaches can be applied to the study of past communities, including micro-studies, oral history and qualitative research as well as quantitative studies. We define family and community history in a broad sense. Family can include studies of family and household structures, personal and family life cycles, family roles, kin relationships and migration. Community history can encompass social networks and structures, paid and unpaid work and religious, occupational, political or other voluntary-based communities. The focus is on the history of the UK and Ireland from the 18th to 20th centuries, although the Journal will publish articles on other areas and places where they make a clear comparative or methodological contribution. The journal is peer-reviewed and combines scholarly methods and presentation with an emphasis on accessibility and an openness to independent as well as institutionally-based researchers.